When invited to contribute “Why I Write,” every answer struck me as a public confession of insanity. At least the honest ones did. At three a.m. I write because I cannot sleep. Anxious thoughts scrabble through my cardboard brain like gerbils, tiny nails scratching as they run. They race around a track, a never-ending loop, until I get out pen and paper. When I write, I can guide those gerbils from Anxiety A and Regret B to Solution C and Decision D. Writing lifts them out of their track and down a path with a happy bit of lettuce at the end. And I can get some sleep. I write to maintain my delusions. I still imagine myself in a black turtleneck, artist-in-resident at some revered MFA program, heralded as the Next Great Mind. I like to believe I will never grow old, that I’m 20 pounds lighter, and that the American public will love the characters I create as much as I love creating them. I like to believe that, despite the demands of my day job, I can find the time and energy to pen great work. I write to bind and gag the realist within who says, “Crazy lady, you cannot have it all.” What does she know? 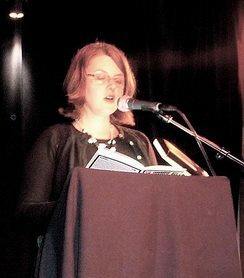 BIO: Nicole Vollrath earned her MFA at Emerson College in 2000. She lives and works in San Diego and occassionally teaches Creative Writing at UCSD Extension and San Diego Writers, Ink. Previous Previous post: Vince Rogers writes because…. Next Next post: Pamela Ahlen writes because…. I don’t think we can have it all at the same time, but we can have it all over the course of a lifetime … at least the “all” that keeps us sane. Loved this! Happy bit of lettuce indeed!